PT Pertamina (Persero) - Pertamina or referred to as "Pertamina Group" is the largest energy company in Indonesia. Pertamina Group - Together with its 23 subsidiaries, 6 associate companies and 7 joint ventures - running business in the field of integrated enegry industry both upstream and downstream activities. Its business include oil and gas, renewable and new energy. Pertamina Group also running business in other supporting business activities in energy. PT Pertamina (Persero) is the national oil company (NOC) of Indonesia and is 100% owned by the Government of Indonesia. The Company has its legal domicile in Jakarta and its corporate office is registered at Jl Medan Merdeka Timur No 1 A Jakarta. The Company runs its business through 6 refinery units, 8 marketing operation regions spread in all over Indonesia. As of September 2015, Pertamina Group's distribution channels supported by 5,283 gas stations (SPBU), 591 LPG filling plants, 206 vessels, 115 fuel terminals, 62 aviation fuel depots, 19 LPG terminal and depots, and 3 lubricant oil blending plants. 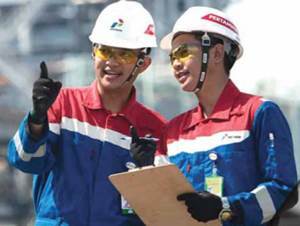 According to PT Pertamina (Persero) Financial Highlight 3Q2015 as quoted by JobsCDC.com, Pertamina Group's total revenue in the third quarter of 2015 (3Q2015, ended in 30 September 2015) was down 41.3% at US$ 31.99 billion from US$ 54.50 billion in the same period previous year (3Q2014), primarily due to lower oil prices. Total current year profit in 3Q2015 was down 45.72% at US$ 0.924 billion from US$ 1.7 billion in 3Q2014. Background in Electro Engineering, Informatics Engineering, Electricity Engineering, Mechanical Engineering, Chemical Engineering, Civil Engineering, Industrial Engineering, Physics Engineering. Background in Telecommunication Engineering, Informatics Engineering, Computer Science, Information System. Background in Telecommunication Engineering, Informatics Engineering. Graduated from Associate degree (D3) with GPA min. 2.75 (D3) and 3.00 (S1) within 4.00 scales. Have D3 academic diploma or Certificate of Graduation (SKL) from an accredited college majors (min B). Not exceed 25 years of age. English score from trusted institution (TOEFL: PBT 400 / IBT 35 /IELTS 3.5 /TOEIC 400). Actively involved in organization activities. Willing to be placed throughout the area of operations of PT Pertamina (Persero). JobsCDC.com now available on android device. Download now on Google Play here. Please be aware of recruitment fraud. The entire stage of this selection process is free of charge. PT Pertamina (Persero) - Marketing Directorate, Corporate Shared Services Pertamina April 2016 will never ask for fees or upfront payments for any purposes during the recruitment process such as transportation and accommodation.